It’s 1959 in Buffalo New York. Ed Sullivan is on TV every Sunday night, gas is 25 cents and kids pretend to be superman. Boys slick their hair back and girls tease their hair up. 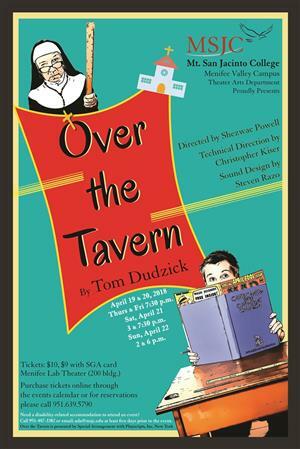 Let MSJC take you back to the good old days with their production of Over the Tavern. It was a simpler time but not around the Pazinski household over their father's tavern. Dad runs the bar, Mom runs the family and 12 year old Rudy is running everybody crazy. He’s a smart, wise-cracking kid who's starting to question family values and the Roman Catholic Church. When he goes up against the ruler-wielding Sister Clarissa and announces that instead of being confirmed he'd rather shop around for a more "fun" religion, all hell breaks loose. Over the Tavern is a show for anyone who has had a family or survived one. A warm and hilarious look at family and growing up with lots of love and laughs. Some mild adult language - Not recommended for children under 11.